I know, I'm supposed to be in bed sleeping (it's past 12am), but these days I have so much to do during school time I don't have time to scrap or blog. And after school, homeworks, activities, dinner and hubby took what's left. 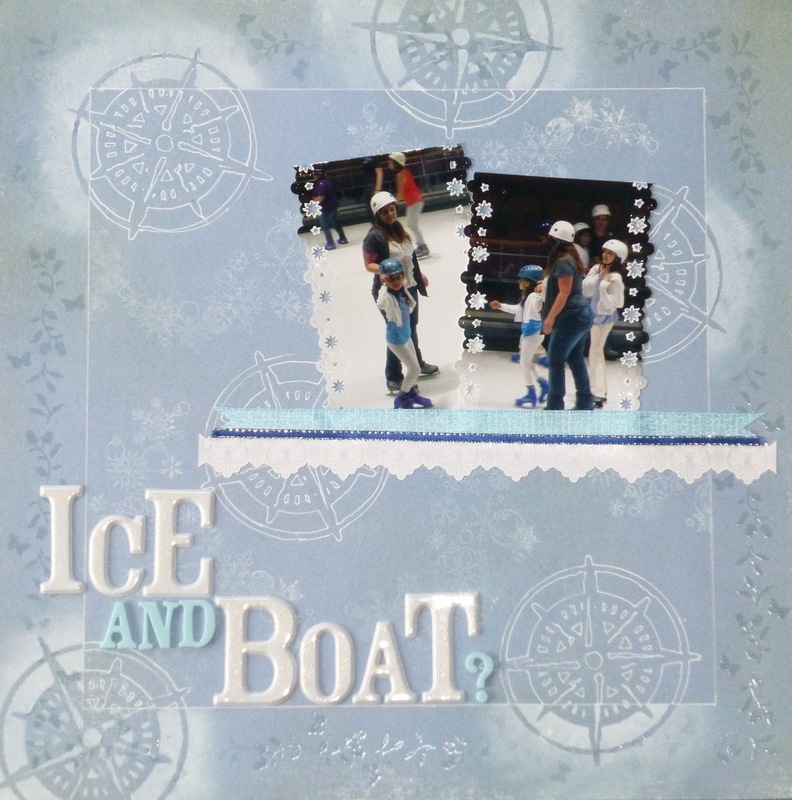 So before crawling into bed and sleeping like a stone, I will post this layout about a unusual ice skating place : on a boat (we were on a cruise). Not the best pictures from this trip (not me behind the camera, on the front for once), but I built this layout some times ago for a workshop about mask and different ways to use them. I used a compass mask by Tim Holtz, white Colorbox ink, and ribbons with ATD and Thickers alpha stickers. You maybe can also see snowflakes stamps in the middle. I used the mask in two ways : as a mask with ink and as a template with white gel pen. Drawing a white gel pen square in the middle of the page makes the compass pop, and the center of the center looks brighter. I have link this page to the ARTastic challenge about masks. Let's cross fingers for me to win. I love what you did with the masked compasses and you really created the feel of winter on here with the perfect colors. Wow! I have never seen that before! I love it! Thanks for sharing! Love the double masking and shadowing here!! Neat way to use the mask! The compass masks are really effective - they suit your photographs so well. Thank you for joining us on ARTastic this month - hope to see more of your lovely work in the future. You have done a fabulous job with your masks, using both the original one and the negative of it. It looks fantastic on your LO. ps. it would be helpful for those who takes the time to leave a comment, if you turned your word verification of. Thank you for joining us at ARTastic with your terrific layout Valerie. I like how you used the two versions of the mask to create your background. Thanks for joining in on our May Artastic challenge, like how you used the same mask but got 2 different effects with it. I love the mask use, what a great page! What we do for scrapbooking, fancy blogging after 12am LOL. The colours you have used set such a cool atmosphere for your photo. The mask you used is great. Thanks for joining in with us at ARTastic this month, it was nice to see your page. Great use of the mask and a really cool winterpage. Isnt that compass mask just the best!! Well done on a lovely winter page and thanks for joining in this month at ARTastic!